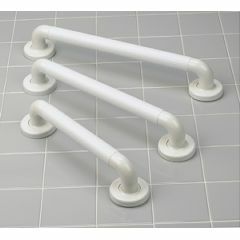 Attractive, wall mounted, plastic, grab bars with grooved surfaces provide a secure, non-slip, grasp - even when wet. Mounting brackets conceal the installation screws. 1 1/2" (3.8 cm) diameter. Distance from wall to bar is 2" (5 cm). Hardware and detailed installation instructions included. Sturdy. Functional. Easy To Install. Lightweight. Safe. Got for my dad, he is 87, he likes it , easy to hang on to, feels secure. Safe. Sturdy. Easy To Install. Wonderful product! Bought for diabled, elderly parent who is very happy with the grab bar. Grooved surface is a life saver! Easy To Install. Safe. Functional. Sturdy. Lightweight. Was unable to find anything like this at a local store. Bath bar with grooves works great for my disabled son. Thanks for providing consumers with such good products. how much weight do these bars hold?